You’ve eaten too much, spent too much, watched too much TV, and drunk too much, but I bet you haven’t read too much. You can always squeeze one or four more books into your Kindle before it explodes especially when they’re free on Boxing Day and December 27th. These are our Christmas gifts to you. Just click the book title, download, and dive into some epic romantic series and a contemporary mystery. Sarah would like to give you these two. Lizzie is heiress to a Scottish laird but gives up her inheritance to follow a command to find love, left in a Book of Hours by a Tudor queen. But royal commands are dangerous to follow as Lizzie finds out to her cost. Can she make her lover’s dream to become an actor come true, fight off the paparazzi when scandal rears its ugly head, and hide a forbidden child? ‘Dangerous Liaisons is a book that you will not regret buying. Sarah Stuart has a wonderful way of writing and weaving a tale. Each of her characters is brought so much to life that you feel like they are real people. Lizzie and Michael’s lives have not been easy. They were drawn together from the very first touch of their hands. Little did they know what the road ahead of them would hold. Towards the end of the book, you really begin to understand the effect that every choice you make has but mostly how strong love can be, and how powerful forgiveness is. From the start to the end of this amazing page turner, you will find yourself feeling every emotion on the scale. from soaring to the top, falling to the bottom then back up again. There will be times in your everyday life when you will try to work out the end but it will never be what you guess. There is one WARNING I would give – you will be begging to have a BOOK of HOURS all your own. I am not sure if this will pass as it has not for me yet. Do I recommend this book? HELL YES!’ – Amazon review. Richard loses his job, his fiancee gives him back his ring, and his ex-wife dumps a daughter he didn’t know he had on his doorstep – and it’s only Monday! Can he make a home for himself, his abandoned daughter, Maria, and his rescue dog, Ben, and still find the woman of his dreams? And I’d love it if you’d accept my gift of these two. A woman in love is unstoppable, and Ella is a woman in love. When Jem and his two cousins fall foul of a gamekeeper, who dies at their hands, they escape the hangman’s noose only to be transported to Van Diemen’s Land for life. Ella, his common-law wife, is left pregnant and penniless and determined her child will know its father; she will do anything to follow the man she loves. ‘Banished for a kiss that she did not initiate, Ella Maundrell finds herself at the mercy of Reverend Buchanan. The Reverend is determined to find a respectable husband for Ella. Ella has no choice but to go along with the Reverend’s plans. But then she met Jem, and everything changed. Little does she know just how much she will have to sacrifice to stay with the man she loves. On Different Shores (For Their Country’s Good, #1) is a heartbreaking story of a forbidden first love. Set in Victorian England, Ella has no rights. She is the property of her husband, Harry, and he can do with her what he wills. At times I found this book difficult to read because of the content. Ella suffers so much at the hands of her husband and his family that at one point I had to put the book down and walk away. However, I was desperate to find out what would happen to Ella, so I picked the book up again and I did not put it down until I had finished. Rebecca Bryn has certainly created a compelling read. The story is fast-paced, with many twists and turns. The protagonist and antagonists are all well fleshed. They came across as very real in the telling. When Alana, an aspiring artist, is left a cottage in West Wales by an aunt she didn’t know existed, she is catapulted into the centre of a 30-year-old conspiracy of silence about two missing toddlers and the local woman convicted of their murders. Alana’s arrival in the village coincides with the woman’s release due to unsafe evidence, and someone is out for revenge on those who perjured themselves. Alana’s dead aunt holds the key, but can Alana discover the truth before revenge turns to personal tragedy? ‘I’ve just finished The Silence of the Stones……….. wow! ….loved it…. best read I’ve had in ages….. couldn’t put it down! 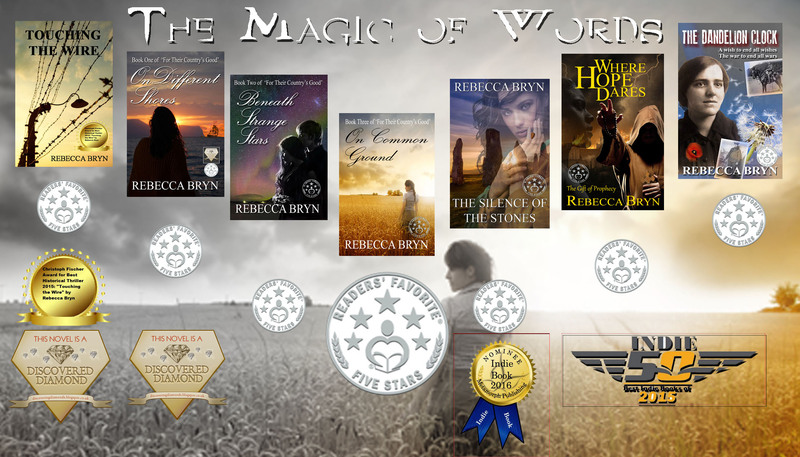 Mystery, magick, wild Pembrokeshire, stone circles, a little romance, and a twist and then another – right up my street. The characters came alive as I read and I was transported to a Pembrokeshire village to live with them for a while to share their lives, their hopes and dreams, and their tragedies. This is the first book I’ve read by this author and it won’t be the last! Thank you for accepting our gifts. We hope you enjoy them, and we’d both love it if you left us a review on Amazon or Goodreads. And don’t forget to tell your friends and help spread the word for Indie authors.